Yefymenko, Petro P. [Єфименко, Петро; Jefymenko], b 21 November 1884 in Kharkiv, d 18 April 1969 in Leningrad. (Photo: Petro P. Yefymenko.) Archeologist; full member of the Academy of Sciences of the Ukrainian SSR from 1945; son of Aleksandra Yefymenko and Petro S. Yefymenko. After graduating from Saint Petersburg University (1912), he traveled through Europe, Africa, and the Orient, and then (1917–19) worked at museums in Moscow and Leningrad. While a research associate with the Leningrad Institute of the History of Material Culture (1919–46), he also served as a lecturer (1924–39) and then professor (1939–46) at Leningrad University. A specialist in the Paleolithic Period, he led archeological expeditions in east central Ukraine and the Don region. 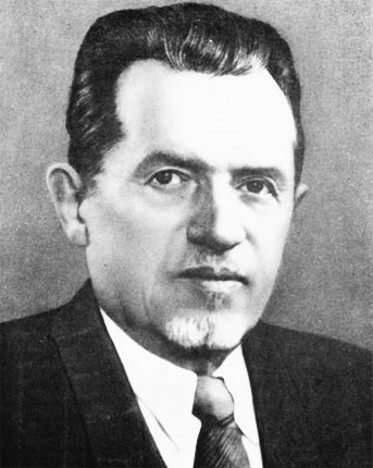 He became director of the Institute of Archeology of the Academy of Sciences of the Ukrainian SSR in 1945. During his tenure (to 1955) the institute launched new periodicals and published the first general survey of Ukrainian archeology, Narysy starodavn'oï istoriï Ukraïns’koï RSR (Essays on the Ancient History of the Ukrainian SSR, 1959).